For some reasons, some owners of the new GS5 handset were unable to update the device's software/firmware downright. The firmware update is accessible from Samsung Kies however the update has failed during the process. 1. A lost connection between the device (GS5) and the computer during the update. Probably users have accidentally disconnected the handset from the computer. 2. Not enough battery power to complete the update. 3. Lost power on the computer during the update. 4. Error writing to the device. Considering the conceivable leading causes, make sure both devices (handset and computer) have enough power or sufficient charge before you start the software upgrade. In case you are using a laptop, properly plug it into the power supply to ensure no power interruptions during the update process. If the issue is caused by other factors than insufficient charge on both devices, then you may need to use the Kies Firmware Recovery feature, otherwise known as the emergency firmware recovery feature of the device. 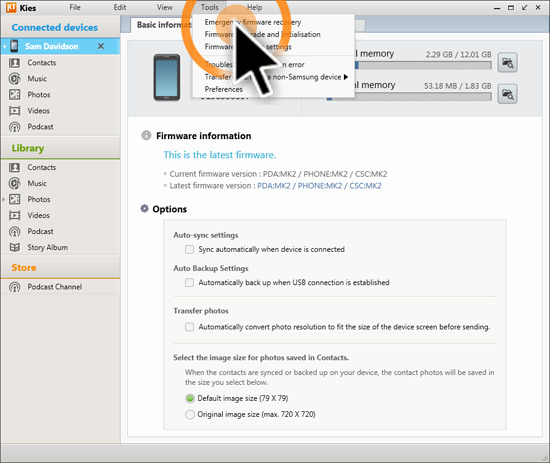 Samsung Kies can recover a device that encountered certain error(s) during an update. The recovery process will let you finalize an update, in case the update failed when using your device's over-the-air feature. This option will only become available if you've already initiated a device upgrade with Samsung Kies and the process was either failed or interrupted. You will not be able to use this process if the Emergency recovery list does not show the device connected. Here's how to revive your device with Emergency Firmware Recovery Feature, in case it fails to complete the firmware upgrade. Step 1. Open/Run the Kies program. Step 2. Click on Tools. Step 3. Select Emergency Firmware Recovery. A list of device will then appear. Note: Devices on this list are only those that require a recovery. Step 4. Locate and select your device from the list. Step 5. A new screen pops up, containing the Recovery code. Take note of this code because you will use this code to restore your device from another computer. Step 6. Samsung Kies will then provide you with the steps to switch your device to recovery mode. Follow these steps to proceed with emergency recovery. Step 7. Click on the Start Upgrade button beneath the screen. That should instigate the recovery process. Step 1. Open the Kies program and click on Tools. Step 2. Select Emergency Firmware Recovery to continue. Step 3. Select Emergency Recovery using the recovery code. Step 4. Enter the recovery code provided by the original computer. Step 5. Switch your handset to recovery mode using the steps provided in Kies. Step 6. Click on Start Upgrade button to initiate the recovery process on your device. Wait until the Kies completes the entire reviving process to get your handset back in good shape.